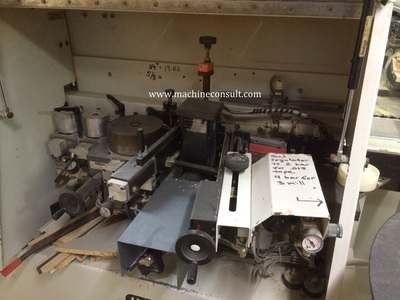 • Ability to program all edgebander functions including: edge feed, glue application, end trimming, flush trimming, radius trimming, scraping, corner rounding, and buffing. • Programs can be easily created and recalled at will. • Screen with graphic interface makes programming easy. • A picture of each unit may be brought up on the screen to show the operator the status of the unit and the parameters which can be programmed. • Virtually eliminates set-up time by merely selecting and loading a program, which automatically activates all required edgebander functions simultaneously. • Each program clearly indicates on screen the units included and their exact settings. • Programs can be modified easily to create new programs. 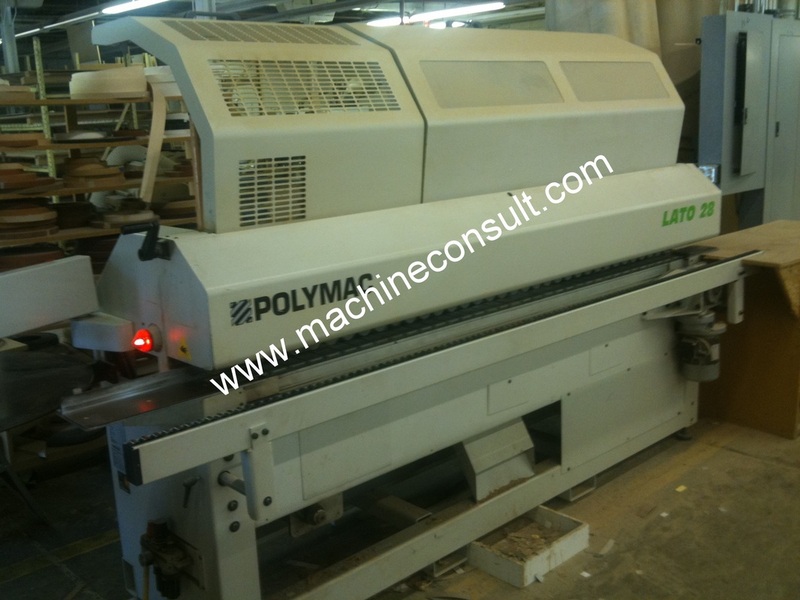 • Edgebander can be operated manually when required, without necessity to write a program. • Eliminates use of limit switches and their normal adjustments related to work station activation along the feed track. • Error messages are presented in plain text, to avoid the need for endless error code lists. • Eliminates many mistakes caused by lack of operator skill. 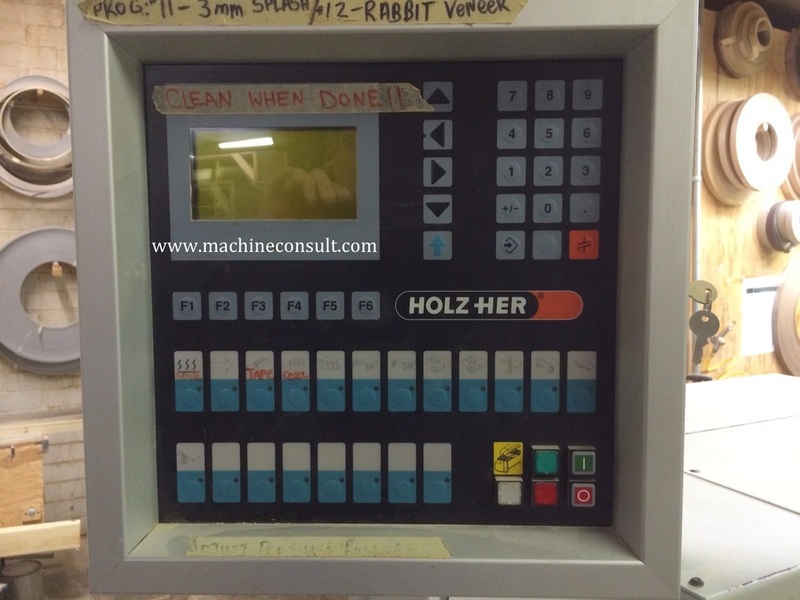 • Latest technology offering many exclusive features and demonstrating HOLZ-HER’s continued leadership in the market. • 1 (one) universal magazine for solid edges, strips, and coiled material. • Utilizes motion detector to ensure accurate, trouble-free positioning of edge material. • Exclusive “TRACTOR-BELT FEED SYSTEM” to ensure accurate, trouble-free feeding of edge material, as well as optimum operator safety. • Angled strip gate to prevent double feeding of strips. 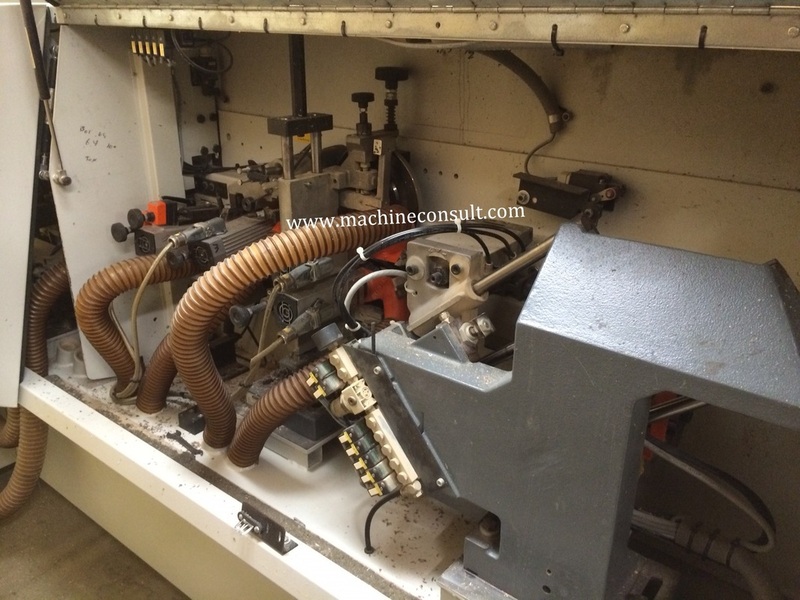 • Magazine table on rollers for smooth feeding of coiled material. • Edge guide equipped with automatic guillotine lock-out for safety. • “3 DEGREE APPROACH ANGLE” allows easy feeding of large wood edges. • Automatic guillotine for coiled material up to 4.0 mm. 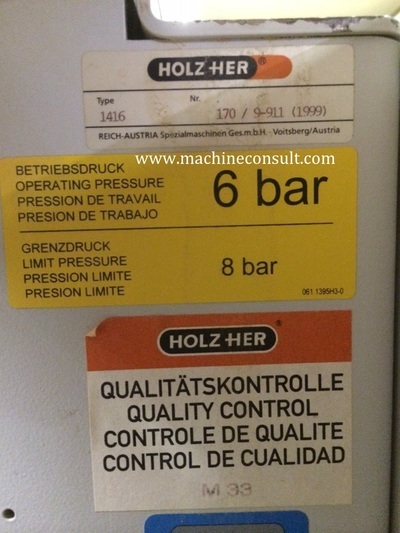 • Equipped with HOLZ-HER'S exclusive patented "CARTRIDGE" glue system. This is a CLOSED APPLICATION SYSTEM in which the glue is enclosed in an air- tight chamber and cannot oxidize, discolor, burn, or become contaminated with wood dust. This allows for optimum glue adhesion. 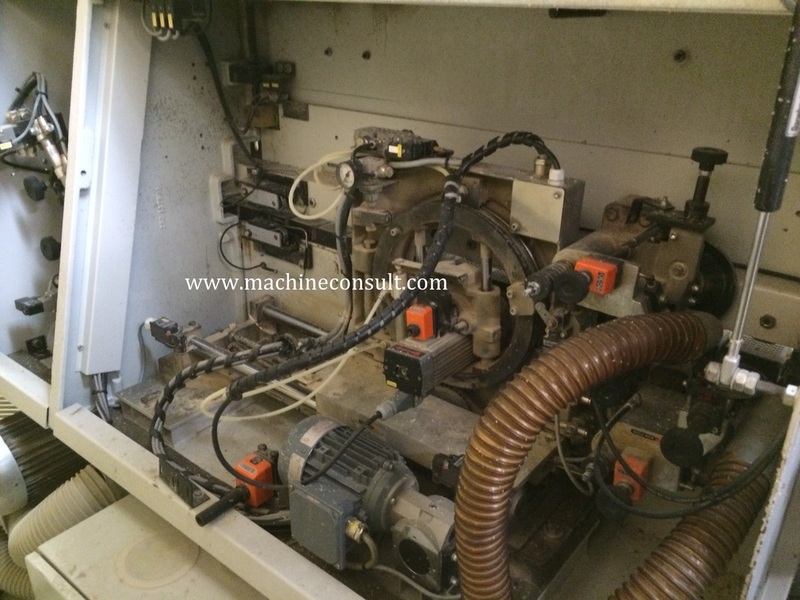 • Glue applied to panel by patented GLUE NOZZLE from 6-45mm workpiece thickness. • Precise control of all functions including begin and end of glue line, height of glue line, bottom of glue line, volume of glue and face melt temperature. • Less maintenance - no glue pot to clean, fewer parts. • Efficient glue consumption - virtually no waste. • Efficient power consumption - uses less than half that of conventional glue pots. • Fastest & easiest glue color change, 5-10 min. • Fastest heat-up time in the industry, less than 3 min. • No fumes or other environmental hazards. • Machine can be used for trimming without heating up the glue section. • Large electronically-driven roller synchronized with feed speed. • Two additional rollers are cantered enabling high gluing pressure and precise banding. • Quick adjustment of pressure section to edge thickness by means of speed wheel and scale. 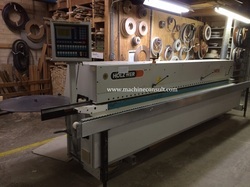 • Heavy duty finish with linear guide bars for precision and trimming. • Mounted with uni-point axis enabling quick change for chamfer trimming up to 10?. • Mechanically indexes ends for a perfect finish. • Motors: 2 x .22 KW Speed 9,000 RPM. • Maximum edge thickness up to 13mm. • Two high frequency motors for edge trimming 0 to 15 degrees. • Vertical and horizontal tracing with uni-point design for no second adjustment when changing the degree of bevel. • Maximum edgestrip thickness: 8 mm. (Standard) 13 mm with optional straight tooling. • Air jets for debris removal. • Radius capability up to 3 mm radius. • Motor: 2 x 0.6 KW (.82 HP), 300 HZ, Speed 18000 RPM. • Uses reversible insert carbide scraping knives on the top and bottom edges. • Normally equipped with radius tooling to finish and remove knife marks created by the top,bottom, and radius units on thick PVC edgings. (2,3 mm). • Equipped with air-jet blowers. • Vertical and horizontal copy wheels. • “PCS” Pneumatic Changeover System moves Scraper Unit in and out from control panel. • Equipped with digital readouts for all adjustment spindles. • For rounding of corners: radius, chamfer, or flush trim. • Possible radius: 2 mm and 3 mm. • One motor, 1 x 0.6 KW, 300 HZ. • Feed speed of 12 meters per minute. Max. • Includes 7 Siko digitals for quick set-up. • Equipped with reversible blade cutterhead with radius knives. • Includes two motors with the possibility of adjustment in any direction. • Incorporates “plunge control” to avoid rounding-over the leading and trailing edges, and ensure tight corners (thick PVC). • Horizontal Swivel = 0 to 20 º. • Equipped with cloth buffing wheels for smoothing the sharp edges of thin PVC band after trimming. • Can be equipped with fine sanding wheels for finishing wood and laminate edges. • Motor Speed = 1440 RPM. Length: 3250 mm / 128 in. Width: 1470 mm / 58 in. Height: 1200 mm / 47 in.